This is for Jonathan Storey, for his letter and his guess, and for everyone who stuck with this feature and sent me such nice notes about it. Thank you. First off, my partner would like you to know that Pola X is under no circumstances my favorite movie, not even by the proviso that rules out The Piano, When Harry Met Sally..., Persona, Nashville, Aliens, or Safe, six likely claimants with the dumb luck to be "too good" for this list. He insists that I talk about it less and watch it less than any one of the six movies that currently follow it on this roster, or Junebug, or Birth, or The Purple Rose of Cairo. Top ten, sure, but first place? Quoth the raven, "Girl, please." His skepticism is also, in part, a response to the film itself, which is abrasive, extravagant, and dramatically murky. He respects its audacity and loves an early shot of a frozen, vacuous bride standing on a stool amidst acres of carefully tended lawn, being fitted for a wedding veil at least five meters long. If you want to see old-money grandiloquence and heteronormative ceremony ironized in one iconic tableau, here you go. Otherwise, Leos Carax's brazenness leaves him pretty cold, as it did the Cannes audience who booed its premiere in 1999. Hostility on the Croisette often augurs well, but Pola X mostly faded from people's radars, and Carax didn't release another feature for thirteen years. That one, Holy Motors, also split audiences but at least drew lots of eyeballs, and the new surge of interest in Carax, that perpetual tyro, prompted overdue Blu-rays of Boy Meets Girl and Mauvais sang. Artificial Eye's four-disc set honoring Carax's career omits Pola X, which malingers on an old Fox Lorber DVD that blurs when you pause it and flattens the ominous sound mix. Worst, it splotches out completely when confronting the film's two essential set pieces: a long walk in pitch-black forest and an unsimulated consummation of sexual desire between the leads. On screen, each of these is a master-class in underlighting, riveting your gaze within indigo and charcoal frames. On disc they are virtual blackouts. I sympathize with people who tire of film geeks gnashing our teeth about the twilight of celluloid and careless digital transfers, but there's a very real sense in which it's nigh-impossible to see Pola X nowadays, even if you've bought a copy. Then again, amidst a theatrical projection of a pristine print, which is how I first experienced the movie fifteen years ago, its colors robust and its conceits bigger than life, you still don't feel like you're seeing all of Pola X. The film is defiantly spectacular, possibly to a fault, but something essential about it crouches inside its own images, like a jaguar in the jungle. This only makes me love the movie more, and partly explains why I don't watch or discuss it as often as I might. I'm loath to desensitize myself to its uncanny power. But that, as is Carax's own wont, was a lot of information doled out quickly. Let's backpedal. Pola X is an adaptation of Herman Melville's Pierre, or the Ambiguities, one of the maddest novels in American literature. Carax rebooted his screenplay ten times before finally devising one he could film. The title testifies to all this travail: Pola is an acronym for the novel's title in French, Pierre, ou les ambiguités, and the Roman "X" denotes that tenth draft. Pierre on the page is a tempestuous vortex of American Gothic, aristocratic turpitude, and overweening ambitions toward a terrifying sublime. You either join the current of Melville's frothing, churning prose or sprint in the opposite direction. The plot is as outré as the style: upstate New York scion Pierre Glendinning, a shining American knight, meets Isabel, a vagrant in a woodland hovel who claims to be his foreign-born, repudiated half-sister. He buys her story and renounces his money, his young fiancée, and his widowed mother, a figure redolent with incestuous yearning for her son, who seems to return the feeling. Isabel flees to New York City with Pierre, who in his newfound penury fixates more and more on writing a prodigious novel, exposing the mendacity and polluted blood that runs like groundwater through American soil. Helixed with his artistic obsession is a swelling desire for Isabel; sister or no sister, she becomes his lover, which further guarantees devastating fates for everyone involved. Carax preserves most of Melville's characters and incidents even as he transposes them to contemporary France. He makes his Isabelle a Balkan refugee: the fruit of Pierre's father's "diplomatic" dalliances, and a grim revenant of Eastern European holocausts that the decked-out West would rather overlook. Carax himself, heir to the Dupont fortune, a dynastic black sheep making punk flicks and Olympic-sized follies under a false name, invests completely in Pierre's prodigal epiphany and derangement. So does lead actor Guillaume Depardieu, a blond god with the heaviest surname in modern French cinema and a very public history of pre-Pola X dissolution. So does Katerina Golubeva, the Russian-born muse to such muscular auteurs as Denis, Bartas, and Dumont. She recounts Isabelle's macabre history in that virtuoso forest sequence, her shrapneled syntax and eccentric pronunciation the legacies not just of Eastern birth but of rude life on the margins of the margins. So do composer Scott Walker, a onetime pop icon reborn as an avant-garde innovator; Catherine Deneuve, that proud avatar of French national identity, who has nonetheless devoted much of her career to wild men and heretics; and a retinue of other collaborators, including resourceful cinematographer Éric Gautier. In their hands, Pola X keeps yielding astonishments: dioramas of Old World wealth that look simultaneously elegant and morbid; obsidian pine trees, out of focus; cryptlike tunnels; bombed cemeteries; rivers of blood in which Pierre and Isabelle bob and cling to each other's naked bodies; a harrowing midnight motorbike ride that ends awfully for the cyclist; a zoo in which the animals look broken and irate; a grimy and xenophobic Paris, where undocumented immigrants perpetually duck and cover; coitus between siblings, in which a close-up of actual penetration pulverizes taboos as nothing else could; and a creepy cult of urban squatters, wailing on drums and electric guitars inside a gutted factory, like the aged-up, downcast, Skid Row version of Fury Road's War Boys. Pola X is the closest Carax has come to narrative realism, less outsized than The Lovers on the Bridge, with its pyrotechnics and miles-long, speedboat-powered sequence shots, and more rule-bound than the dadaist vignettes of Holy Motors, but it's not conventional. To rival Melville's plumes of disquiet and perversity, as Carax does, already entails one heck of an addled vision, but Pola X acts like a collapsed star, pulling even more registers of art, music, and literature into itself: 19th-century American epic, experimental rock, Shakespearean tragedy, and French naturalism, with its urban rot and carnivorous human wills. Imagine Zola, Buñuel, and Queensrÿche making Wild at Heart and you're in the right arrondissement. In other words, Pola X honors one of the hardest books I can imagine honoring, and does so through vigorous testing of every cinematic resource: editing obliquely, playing with visual scale, pushing the lightmeter to extremes on both ends, blending Brahms and Purcell with modern metal. This is a promising recipe for delighting a film and literature nerd like me. But Pola X goes further, conveying not just Pierre's manifest content but the ghost-face of Melville's prose, the ineffable roil that propels and underlies his words. "A great book is always the inverse of another book that could only be written in the soul, with silence and blood," Gilles Deleuze said in an essay about Melville, whom he praised for an ability "to carve out a kind of foreign language within language." Pola X achieves this, too, using music cues, eerie images, sudden cuts, and high-strung, mysterious performances to imply a silent, bloody movie inside this one, a chaos of eddies and ids. As unruly as Pola X is, you sense an even greater unruliness at its core: similar to what some people sense in The Shining, I think, but less clinically realized; or what haunts so many of us in Vertigo, but without the redeeming valence of cultural canonicity, and without the immaculate visual surface as an ironizing foil to all those implacable pathologies curdling just beneath it. Pola X is a palimpsest of vertigos, foreignness within foreignness, madness laid over madness, as tangible in elite flats and landed estates as in grave-dark thickets and dilapidated hangars. It's hard to know if Carax, Depardieu, Golubeva, and their colleagues have jointly entered the same void, and if it is the same broad void Melville plumbed, or if each has faced an inner abyss of her or his own. Either way, Pola X suggests that its characters, actors, and creators have all made contact with something inchoate and, even more impressively, have found a way to translate to the audience that sense of an encounter with obscurity. Not everyone, of course, craves such sensations, nor would they necessarily derive them from Pola X. I know some people sense a film similar to the one I do, while others perceive a strange, disjointed, not altogether enlightening drama of capsized privilege and maniacal self-sabotage. All of this makes Pola X a hard movie to recommend and a risky one to plant atop a list like this. But its obdurate, uncrackable privacyan essential aspect of the film though hardly an obvious one, given its penchant for visual ostentationis why I treasure it. Because the truth is, the single thing I love most about movies and moviegoing is the solitude, the inwardness. That's odd to say, given that I have made almost every choice a person can make to heighten and savor the collective and discursive pleasures of cinema, from hosting a website to teaching film courses to befriending so many fellow cinephiles. Still, the fundamental appeal that movies have for me is my sense of watching them as nobody else might be watching them, and sometimes the sense that they are watching me. Great movies, for me, are those you can discuss at length, even over years, without depleting your stockpile of unexpressed reactions and idiosyncratic investments. They remain in some way yourswritten in your soul, with silence and bloodeven as you share them generously with others, and they with you. I have alluded to so many films on this Favorites list that are all the more beloved for the role they have played in my writing, my teaching, or my personal relationships, but I've rarely promoted Pola X to anyone in these ways. A story about jealous secrets and intuited bonds, it's also an object I've tended to guard as a strange personal totem, made by a filmmaker who puts on a better show than almost anyone else of speaking his own language within language, pleasing nobody but himself. I remember leaving the theater feeling newly provisioned with images I'd never forget, but also puzzled and embarrassed by how legible this fervid dream had felt to me, how inexplicably familiar despite its fathomless quiddities, separate from the debatable question of how "good" it is. So it's no surprise to me that few people know (or have known until now) how much the film has meant to me or why, especially since I barely know myself. I tend to intellectualize, as you might have clocked, to be readerly in my approach to art and life, and to trust that I can articulate some version of what I think or feel, even when what I'm articulating is confusion or ambivalence. But Pola X, as much as The Piano and Morvern Callar but like few other features, deactivated this reflex. I absorbed it directly as memory and dream and still mostly relate to it that way. This isn't to deny the aspects of the film that invite or even demand critical thought, including its potent vision of a fractured and fearful France and an internally riven Europe; were it made today, I'm sure Isabelle would be a Syrian or North African refugee. I'm also marveling at how many high-placing films on this list have trailed earthbound deities as they are brought low: Hubbell Gardner, Isabel Archer, Frances Farmer, Bill Harford, and now Pierre Valombreuse. I don't especially identify with these character types, nor do I take vindictive pleasure in seeing them humbled, so at some point I'll mull over why so many martyrs, targets, and self-immolators populate my favorite films. I waffled as this countdown neared completion about whether and on what grounds Pola X deserved a higher pedestal than Velvet Goldmine, which has figured much more centrally in so many aspects and moments of my life, or The Way We Were, which is so lashed to my feelings about specific family members and to the whole sensation of being reared into movie love and making sense of an adult world I was only barely joining. But again, it's the very oddity and inexplicability of Pola X that kept putting it on top. Indeed, it was the prospect of facing and showcasing this movie that inspired this whole feature to begin with. If I ever attended a party and met a Velvet Goldmine fan, a Way We Were fan, and a Pola X fan, I'd praise heaven and Tilda for leading me to such ideal company, but the Pola devotee is the one I'd approach most eagerly and nervously, presuming that we must connect on a level that might take some digging to uncover. Or would I avoid this person, cleaving to my sense of private dominion, preserving Pola X as my peculiar siblinga doppelgänger cabin'd and cribb'd in the forest of my subconscious? 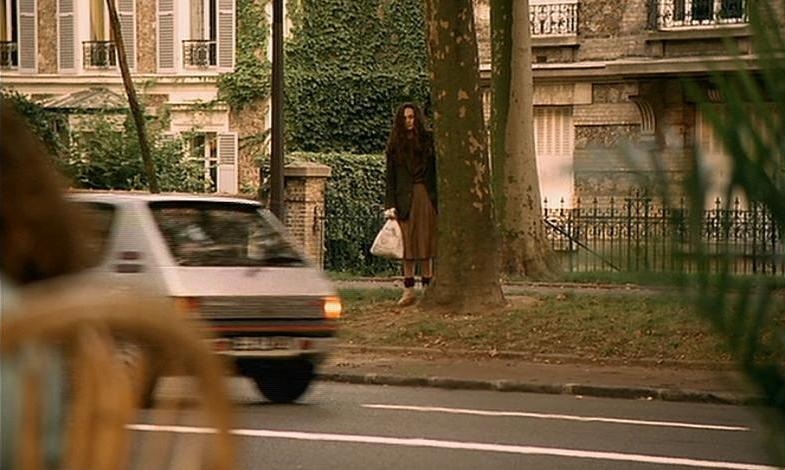 The film stands in little danger of being demystified, and if anything grows more occulted: Carax isn't one to resolve the riddles in his work, and Depardieu and Golubeva have both met untimely, unnerving deaths. He was almost exactly my age, completing a movie called, aptly, The Childhood of Icarus. She died in 2011 and to this day no cause has been specified. The envelope of secrecy and strangeness around Pola X cannot be romanticized in every respect, nor will it ever be fully opened. The film seems fated to speak for itself, however odd its grammars and tonesor not to speak for itself, since something else I cherish about Pola X is how it feels stubbornly semi-shrouded inside its director's mind, impenetrable even to admirers. I love when movies elucidate life and character, but it's rarer and more thrilling when they reveal and conceal in equal proportion, and do so in full service to the material. Pola X is a movie I frequently think about on the cusp of sleep, and resembles a REM state even as it unfolds. As Ada McGrath whispers, bound to her instrument, floating above it, "It is a weird lullaby, and so it is. It is mine." Hey, Reader: And that does it! A decade onward, with capsules inevitably blooming into essays. I'd love to hear more about your favorite movie(s), especially the ones you love in ways you suspect few other people do. I've also added a few more prompts like these to other recent entries in the Countdown where I meant to provide them. At some point I'll update with more movies I've fallen in love with since initiating this feature. But for now, thanks so much for reading and responding to all these thoughts.